Hey, ladies and gents! I'm participating in Daily Buzz Style's 9x9 "Runway the Real Way." I absolutely love fashion week. I think the best part of reviewing the different shows is recreating the look on your own. I love couture as much as the next girl but let's be honest, it's often not very practical. One of my favorite designers, 3.1 Phillip Lim, always blows my socks off! I love his simple color palette and tailored separates, perfect for the young professional. 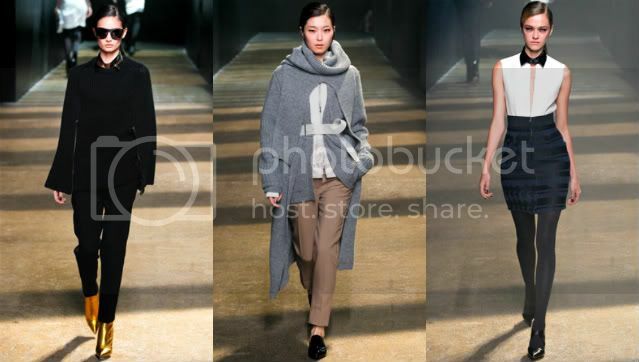 For my look, I chose to make an outfit from my favorite elements from the 3.1 Phillip Lim RTW Fall 2012 show. I loved the metallic touches, camel, gray, and black color combinations, capes and textured minis. You can head over to style.com to check out the rest of the 3.1 Phillip Lim collection.